One might think that only romantic relationships can be toxic, but they also include relationships with toxic parents, too. Toxic parents don’t respect their children as individuals with their own separate identity. They don’t take responsibility for their behavior nor would they ever apologize for being wrong. These parents sometimes, suffer from some mental conditions as well. In some cases, they are not even aware of what their parenting habits could be doing to their children. 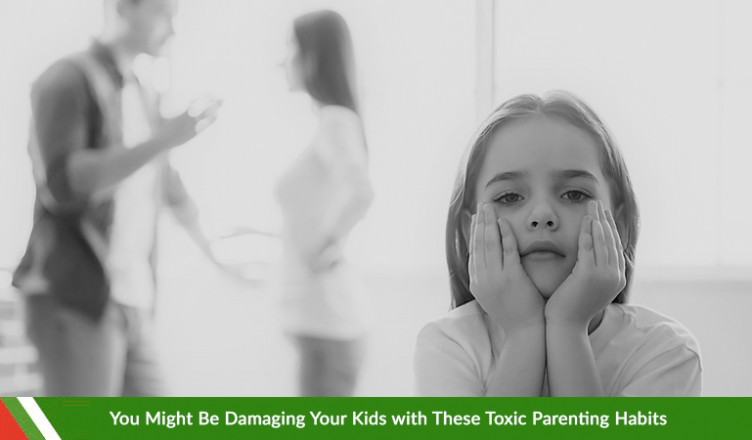 When toxic parents don’t heal, they can pose serious damage to their children that makes it difficult for them to grow as a mentally-healthy individual. The recovery is equally difficult. Children who grow up in such kind of parenting environment might not realize the damage and are in denial even when they are older. A large number of parents still believe that parenting should involve plenty of strict rules and harsh discipline. These parents basically think of punishment as the only way to keep their kids disciplined. Although this works for making them obedient but does not necessarily lead to a healthy long-term parent-child relationship. Children need encouragement alongside correction. They become insecure and unhappy when they don’t get the praise and appreciation they deserve for accomplishing something. As a result, they feel that they would always have to try to win their parents’ approval. Also, they feel they wouldn’t be able to reach their goal. It is important that parents learn to differentiate between rebellious behavior and genuine little mistakes. And then, decide which act is worthy of punishment. If a child makes a foolish mistake, teach them gently and encourage them to do better next time. Do praise them when they succeed or achieve something. Your words of appreciation could do wonders for their self-esteem. Not showing or expecting any respect for personal space is another problematic situation. Some parents don’t expect their children to respect a parent’s personal space while some don’t show any respect for personal space for children. On the other hand, some parents fail entirely in both of these areas. It is important to consider that both of the extremes are unhealthy. These actions don’t necessarily teach children what they need to know regarding boundaries. You cannot walk into a child’s room at any time unannounced or allow them to do the same to you. It is crucial to teach the kids that they have to knock and ask for permission before going into anyone’s room. You can have areas in the house the kids are not allowed to enter and there is nothing wrong with that. At the same time, also let them know that they have a right to their own personal space. It is not necessary to constantly breathe down their necks in the name of supervision. You cannot possibly be with them at all times. Be the best example yourself and teach them about healthy boundaries and respect as well. This resonates with our first point. Parents who withhold any kind of praise or encouragement fall into the habit of criticism. And they do it excessively. They naturally become overly critical of their children and whatever they do. As a result, kids end up feeling defeated. They lose their confidence and grow up thinking that they will never be able to get your approval and please their parents. So, next time you find yourself being overly critical and jumping all over them because of a small mistake that they made, take a pause and think. Is it necessary? Can’t you do without crushing their spirit like this? It is good to teach children the right way to do things but sometimes even if they don’t follow your way, doesn’t necessarily mean that they are wrong. It is great to be one of those parents who love to spend time with their child, but this bonding has to be up to a certain limit. When taken to an unhealthy level, this converts into smothering and no child wants to be smothered by their parents at all times. When children are young they follow you everywhere and it is quite normal for them to spend time with their parents. As they grow up, they need to have their own space for their personal growth and personality development. You have to allow them to have more independence. There is nothing wrong to let them spend time with their age fellows and hang out with them. Always make an effort to know your children’s friends as well. This way, your children will learn important social skills on their own which are needed to grow into responsible adults. You cannot and should not hover over their shoulder 24/7. You cannot expect them to be with you at all times. If you are with them constantly, their personality would not blossom on its own. In the long run, you wouldn’t want to have a teen at your hands who cannot think for himself or figure out the simplest of things on their own without your supervision or intervention. Yes, it does exist. It may sound hard to believe but some parents bully their own children. For some, the only way to get their kids to do something is to bully them or make them afraid. These parents actually resort to screaming, violence and even threatening behavior to intimidate their children and force them into compliance. The results are no less than disastrous in the long run. Those parents who bully their kids fail to have a good long-term relationship with their children as they grow into adults. The children keep themselves at a distance and are afraid to come and talk to them about their problems, fearing humiliation or ridicule. Parents who opt for this bullying style of parenting need to learn that there is a difference between being fair, establishing discipline, and being cruel to your children. Your child deserves and needs your love and attention rather than the attitude of a bully. Show them love and courtesy even if they make mistakes sometimes. Hovering parents have given birth to a parenting style called helicopter parenting. It has become quite prevalent in today’s society. Helicopter parenting has led to a lot of spoiled and entitled kids who run to their parents the moment they feel that they wouldn’t get what they want. It is extremely difficult to be with these kinds of people who have been brought up by helicopter parenting style. As a parent, it is your job to ensure that you do not resort to this style of parenting and be one of those who try too hard and make it their job to get their child what they want, be it a lead part in a school play or some sport. Your desire to shield them from all kinds of harm is bound to backfire when they get out into the real world someday. It is essential that when you come up with a rule, you enforce it and be consistent in it. Your children should know that they have to follow the rules and take them seriously. If you fail to take action and do not act upon the said decided punishment when the rules are broken, you actually prepare them of a life where they can disrespect law and order outside the home. This kind of attitude can lead to many problems later in life as children never learn rule following in the first place and even if they did, they had no idea that rule-breaking leads to punishment. So, when you establish rules in your home, it is important that you let your child know about the consequence if they break the rule. Then, if they do, follow through that punishment. In the failure of doing so, your child gets mixed messages and this way, they learn to manipulate you into not being strict about rules. This may seem hard but it is essential that you be consistent and stand your ground. There are too many distractions around us at all times; technology being biggest one of them as it has taken quite a toll on all relationships. Give your full attention to your child when they want to talk to you. Be there for them unless you have something very important to do. If you are genuinely busy with a task, let them know that as soon you are done with it, you’ll listen to what they have to talk to you about. It is normal that the things that interest your child seem trivial to you and sometimes boring even. But, when your child is chattering away random things, they might tell you something important as well and open up to you about something that could be troubling them. If you are too absorbed in your own life and too busy to pay attention to what they have to say, they would decide to deal with their issues on their own or rather confide in someone else as you have to interest in their lives. There is nothing wrong in being attentive to your children’s needs and providing for them. But, do not wait on hands and foot. Every parent wants to teach his child to be a self-sufficient and independent adult someday. But that is not something that happens overnight. It takes gradually learning and time. And there is a fat chance of that happening if you, the parents, take care of every single thing of your child even when they have reached teenage and off to college. If your child doesn’t even know to fix himself a sandwich or other quick meals, do their, then that’s a problem. As children get older, they develop some skills on their own and build self-confidence by learning to do everyday things such as mowing the lawn, driving a car, cleaning up their room (maybe), do their laundry (maybe), and cook. They don’t have to be expert chefs but learn to survive on their own when you are not around. Don’t fall into the habit of spoon feeding your child when they are way past the toddler age. Stop treating them like little children who cannot do a thing on their own. If you or your partner have gotten into any of these habits, you need professional help. Consult a couple counselor or a family therapist who could assist you in letting go of these toxic parenting habits that could damage your children in the future. If it is your partner who has any of these habits and refuses to go to therapy, then go on your own. It could be a learning experience and you could learn ways that could assist you in being a good parent while helping your partner curb their toxic habits as well.